Having just spent a couple of weeks in parts of Europe where the food, is smooth, rich, mild, and temperate, I need a change of (flavour) scene. It was all so delicious, but now I crave spices, herbs, bitter, tart, and a little bit of aggression. I hope you do too. 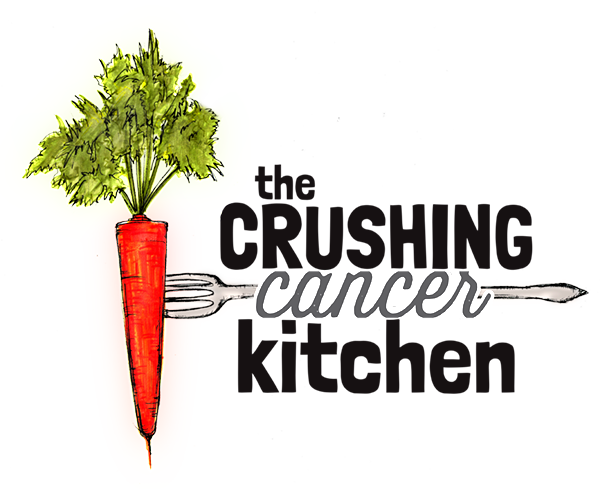 The healthier, Crushing Cancer version of the falafel is baked at a low temperature instead of fried, refined oil-free (all of the fats are whole fats, derived from nuts and seeds), and gluten and bean-free. 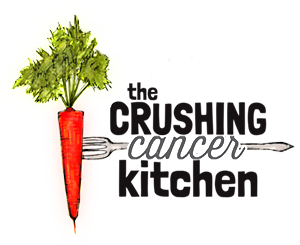 Everything on my site is naturally gluten-free, (we are looking to lower inflammation, not cause it, right?) and the lack of beans in this recipe is good news if you have trouble digesting them, but the culinary reason that I am using almonds, pumpkin seeds and flax in place of the mighty chickpea is that they create a firmer texture with a bit of crunch (we are looking for crunch from somewhere other than the deep fryer). 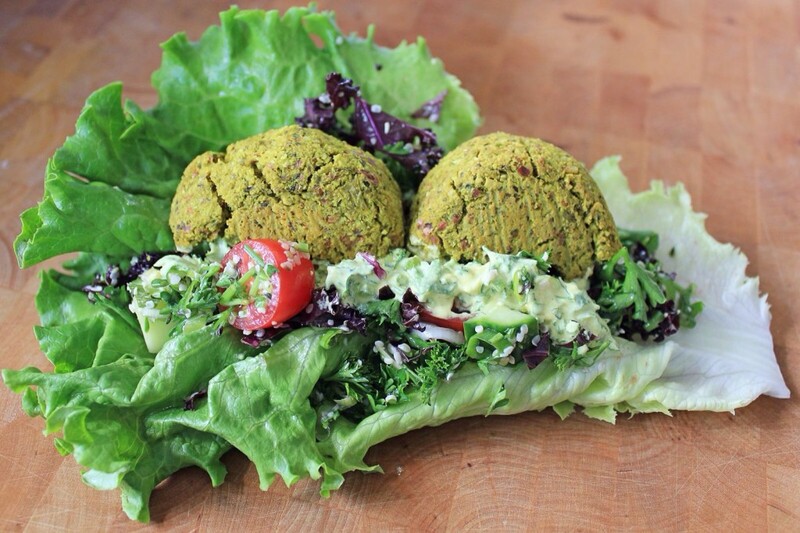 From a let’s not feed the cancer perspective, these falafel are low glycemic, full of healthy fats, fiber, magnesium (a relaxing falafel), calcium (bone-loving falafel), and zinc (immune-boosting falafel). 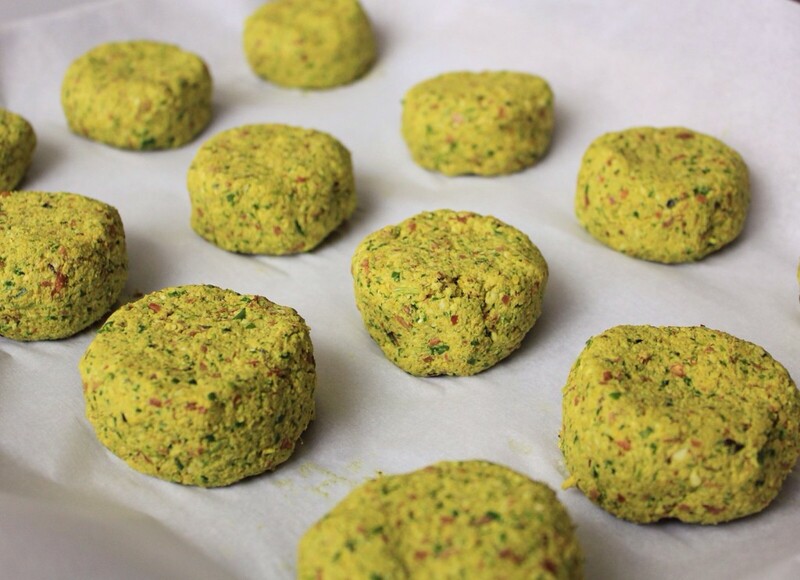 If you have a dehydrator, these falafel work VERY well raw. Dehydrate for 12 hours at 115*F. If you roll them in some ground flax after shaping them, before they go in. 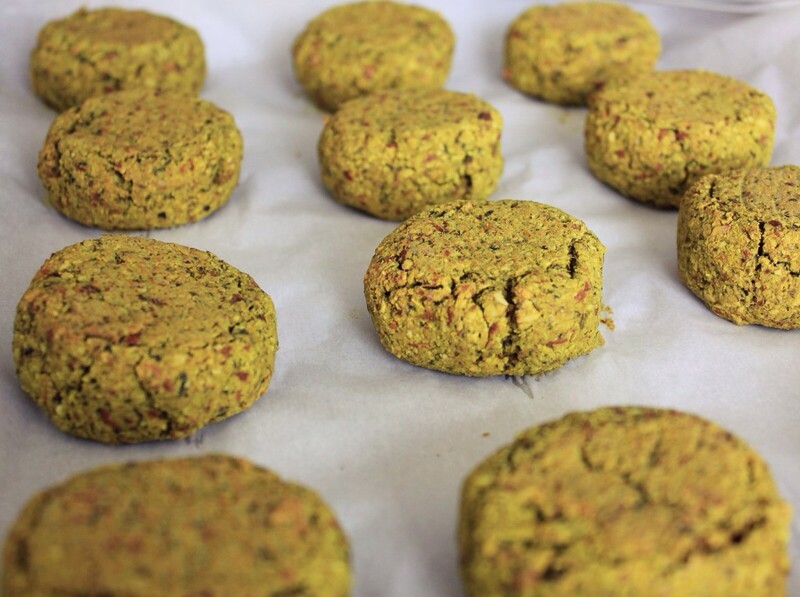 As they dry and shrink a little bit, it will give that crispy exterior that falafel are famous for (not slimy, like flax is famous for). What is falafel without a bit of garlicky tzatziki and some lemony, vibrant tabouli? The tzatziki is cashew-based and therefore dairy-free. Cashews are bland enough that with the addition of garlic, lemon, cucumber and herbs, all you will notice from the cashews is their creaminess, which is deceptively dairy-like. 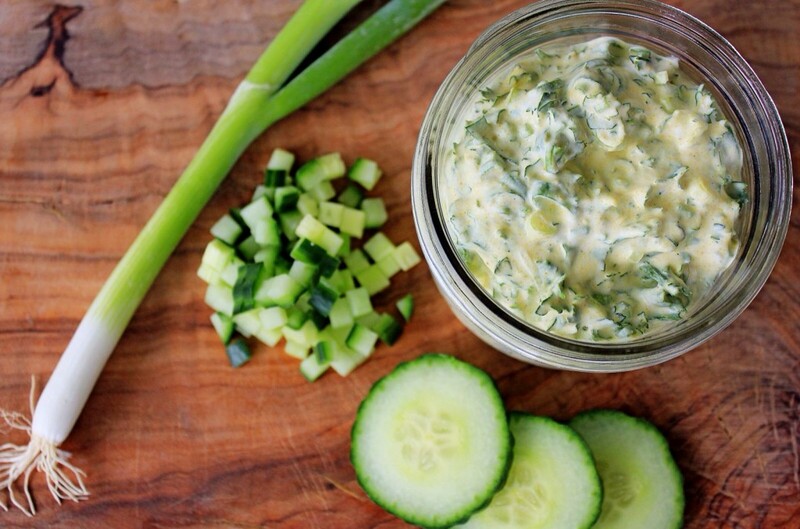 I also added turmeric for an anti-inflammatory kick, and because this tzatziki can handle it. All yellow, all the time. 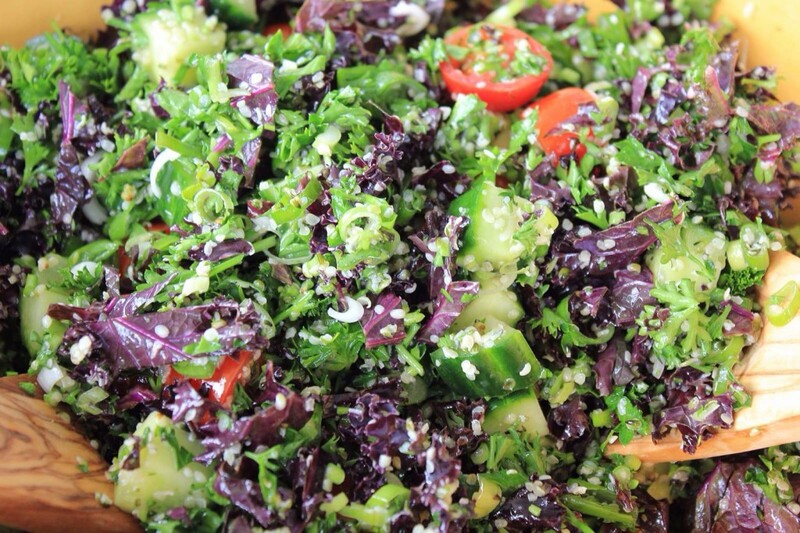 Tabouli is pretty healthy in its classic form, but I have added some beautiful purple kale (cruciferous veg for anticancer power, and extra purple pigment for all of the nutrients it brings with it) and added lots of hemp hearts (protein! healthy fats!) in place of a grain. 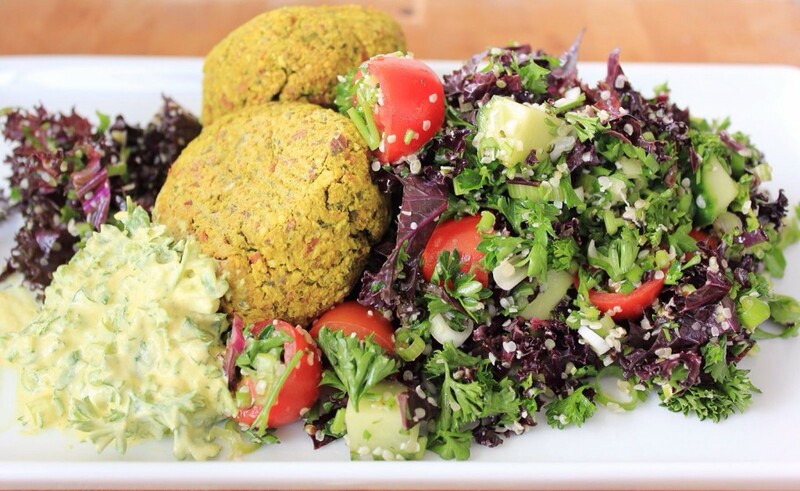 These falafel are filling, and I want you to have lots of room for the salad, so straight-up greens and veg it is. They keep for a few days, as does the salad and tzatziki, so make the full batch if you don’t think you’ll get sick of them (or if you have enough mouths to feed). Enjoy them plated, just as they are, wrapped up in a lettuce leaf or collard green with fermented sauerkraut or carrots (set up your own Maoz bar and go back for seconds for free! ), simply crumble the leftover falafel on a salad, or reinvent them with some thick-cut roasted eggplant and red onion slices, and sun-dried olives. Preheat the oven to 300*F (with convection, if you have the option). Drain and rinse the almonds and pumpkin seeds. 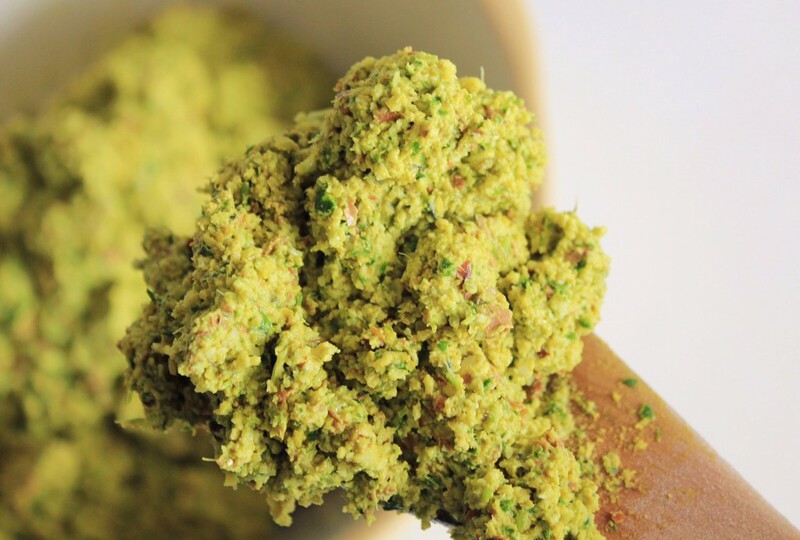 Throw them into the food processor with everything else EXCEPT the ground flax. Blend, scrape, blend, scrape, until it is well blended and mixed. Add the flax and mix again until well blended (it will tighten up like play dough). Lay out on a parchment-lined baking sheet, and bake for 30-45 minutes, size dependant (flipping them over halfway through). They should be dry and a little cracked on the outside, and preferably not browned. 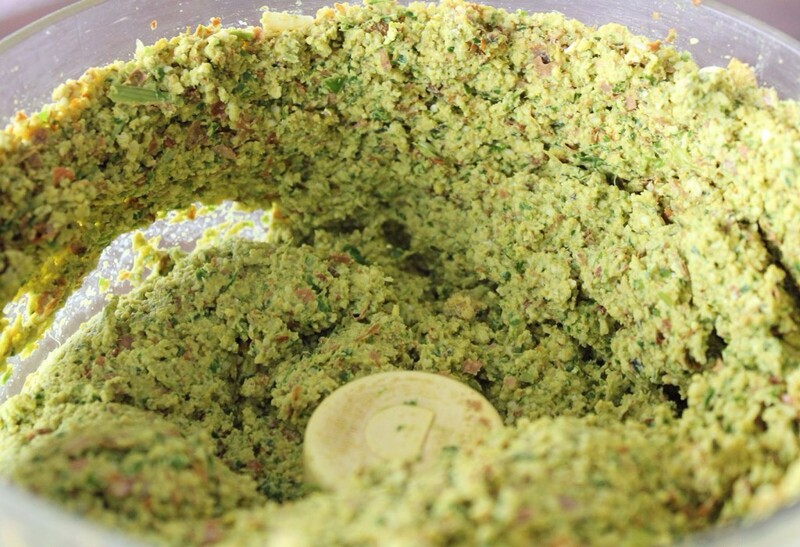 In a blender, blend the cashews, garlic, lemon juice and water together until very smooth. 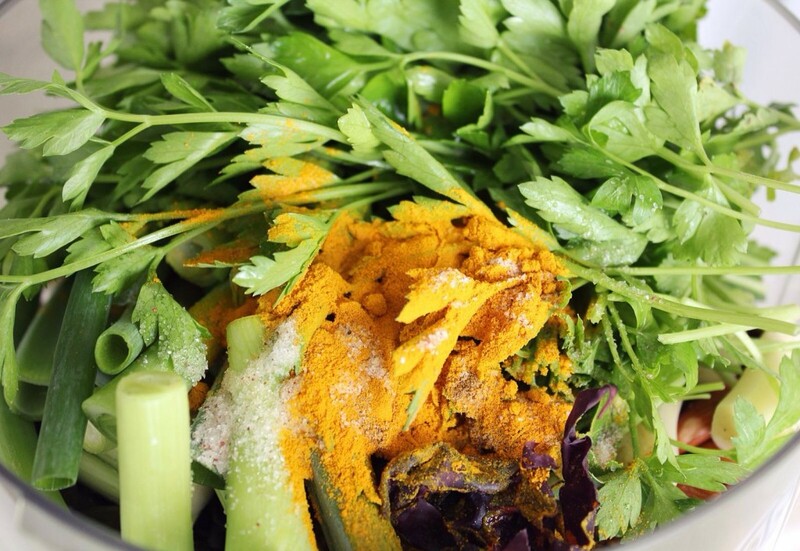 Pour into a bowl and stir in the rest of the ingredients.